1 day workshop -1 completed art work. We will be experimenting with the rusting process on fabric and threads. 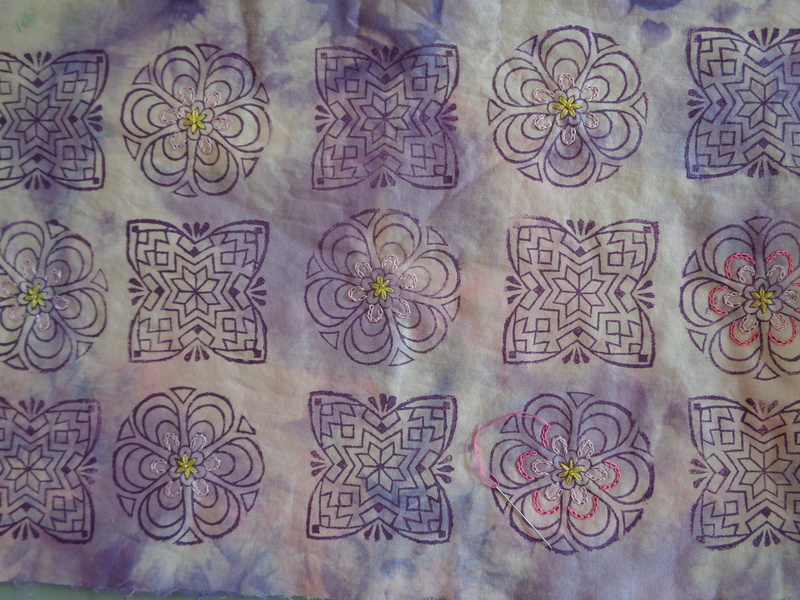 Adding woad paint in, then drying off one sample and stitching into it, then framing the finished work. Minimum / maximum number on workshop: No more than 20 please. Cotton or linen fabric 1-2m. White Perle, Coton a broder or similar threads 2-3 .
ziploc bags or takeaway containers. Found rusty objects, black tea, green tea, fruit tea, orange juice. Clothes rack to hand fabric samples to dry. rusting powder, vinegar, sodium bicarbonate powder, woad and various modifiers to experiment with. I can take cash, cheque or card payments. I will provide all the paper to make the basic folded books. All these things to bring are optional so don’t worry, you can just turn up if you want to. 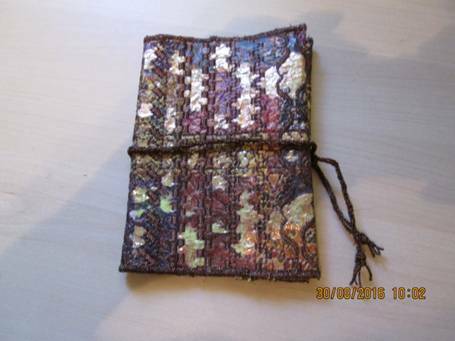 I will have traditional patterns for you to copy and decorate the books if you wish to. Backing fabric – non stretch, e.g. calico, soft cotton. Small pieces of fabric (again non stretchy), in your colourways, some plain, some patterned. Bondaweb to cover your base fabric. I will bring some which will be available at cost. Crazy patchwork stitchbooks if you have any. I will provide handouts with stitch patterns. Please ring 07528271426 if you need advice. 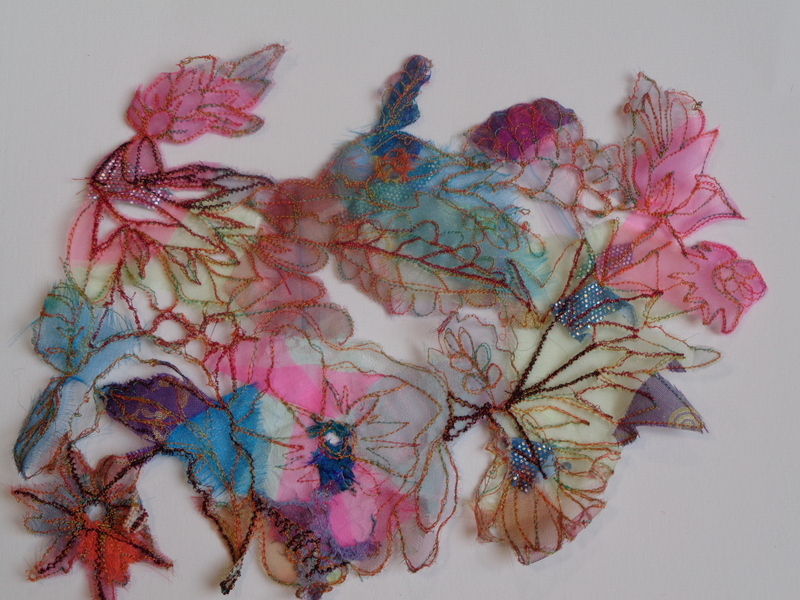 This one day workshop will introduce you to the amazing textural effects that you can create with shrink polyester. Using a variety of fabrics and your sewing machine you will make a variety of samples using free motion stitching and using the preset stitches on your sewing machine. You will go home with a collection of wrinkles to be proud of! Darning foot/free motion embroidery foot for sewing machine. Variety of sewing machine needles. Sewing kit – scissors (fabric and paper), pins, tailors chalk etc. 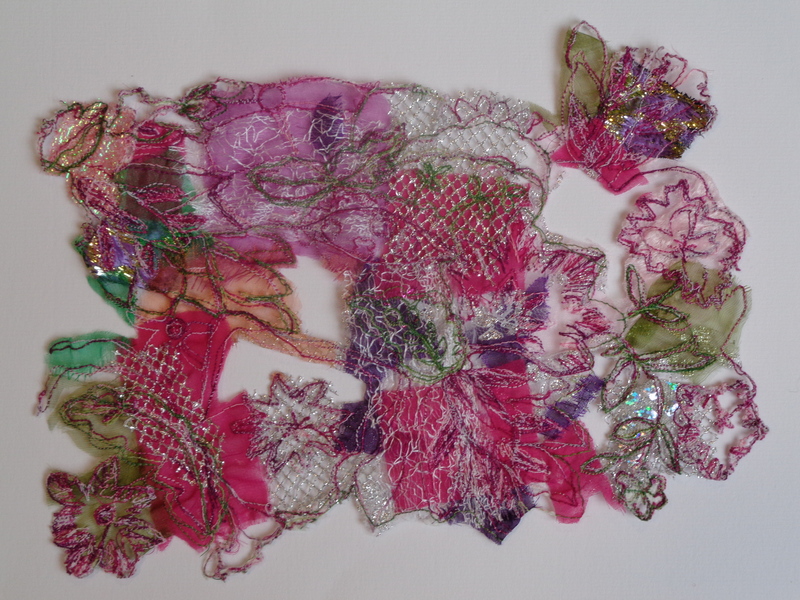 lace, ribbon and/or sari ribbon. I will supply a small piece of A5 water soluble Stabilizer at £1.35 if you do not have any of your own. Photograph of garden or landscape with flowersor foliage. Ypou canadd twqo photographs together to make a good design. A few plain white or cream paper serviettes. Coloured felt, wool mix is good, in colour of your choice to compliment serviette in same size as the serviette. I will be bringing most of the equipment including a few blocks, screens, printing inks, squeegies, brushes for cleaning etc. Our aim is to print on fabrics, a tote bag (I will have some for sale at £1.00 each if people wish to print one) and if desired learners can bring items they may already have such as a cotton apron, tea towel, pillow cases or even a cotton skirt, top or dress!! We will use screen printing methods, some block printing and I will also demonstrate how to create your own economical block. This will be worked as a rotational workshop where learners take turns to print after I have demonstrated. 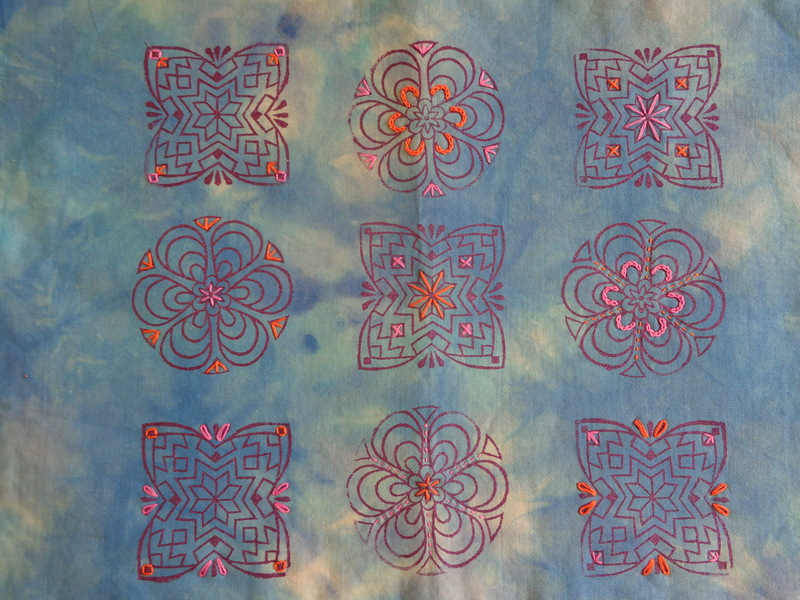 A selection of fabrics to print onto such as cotton, calico, polyester cotton. If desired a cotton bag, apron, tea towel, pillow case, cotton skirt, top or dress. A bag and newspapers/kitchen roll to protect work on route home. 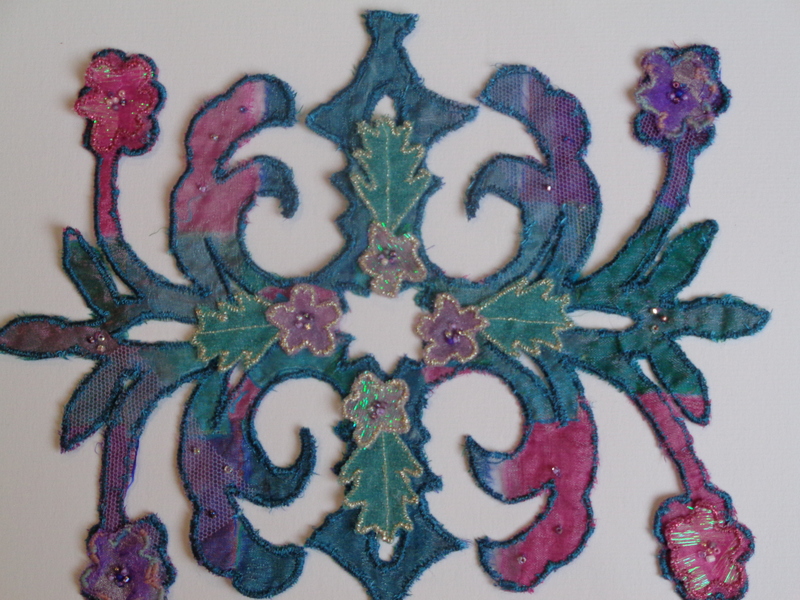 To introduce the technique of layering in machine appliqué using bondina. 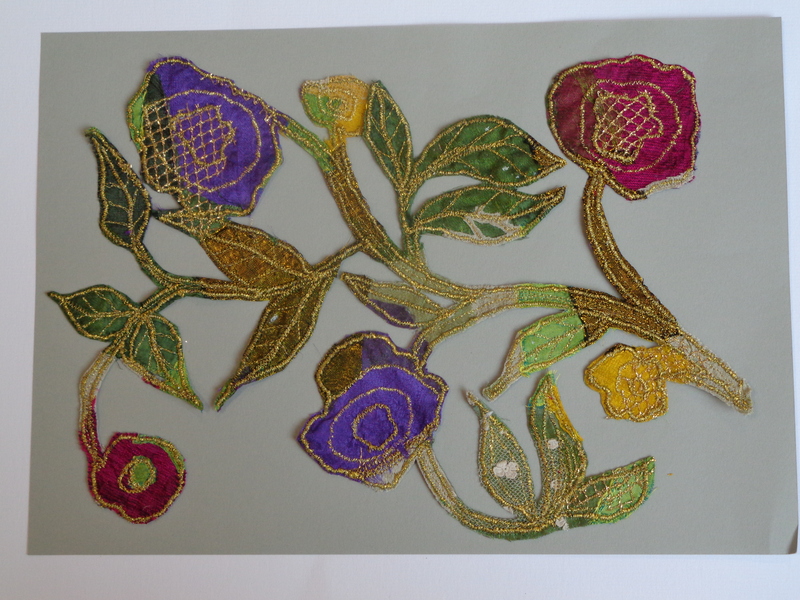 Demonstration of stretching & mounting embroideries. Piece of fabric for backing 30x40cm Calico is ideal. Fabric for appliqué: Relevant landscape colours in differing weights include chiffons, sheers or nets. Threads or cords for couching, a couching foot if you have one. Select your design, I can supply some options, or choose a landscape photograph. You could add colours to your design with pencil crayons to help you decide on colour ways. Choose a variety of fabrics to suit your design. Silk is a lovely fabric to use because of its lustrous shine & depth of colour. The fabric needs to be a medium weight cotton or linen (around a thin curtain type weight) NOT polycotton or other synthetic fabric – you could embroider the fabric. The decorations need to be within the area 23cm x 17cm. All things to bring are optional so don’t feel you have to bring all these. All basic materials are supplied and I will have a selection of tools/glue etc for people to use. 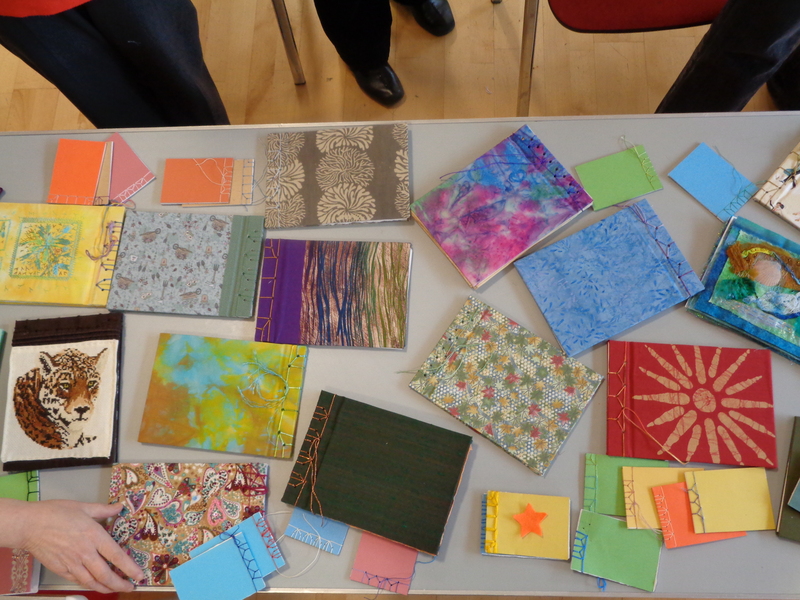 I will also some materials to buy if you think you would like to continue making books after the workshops. 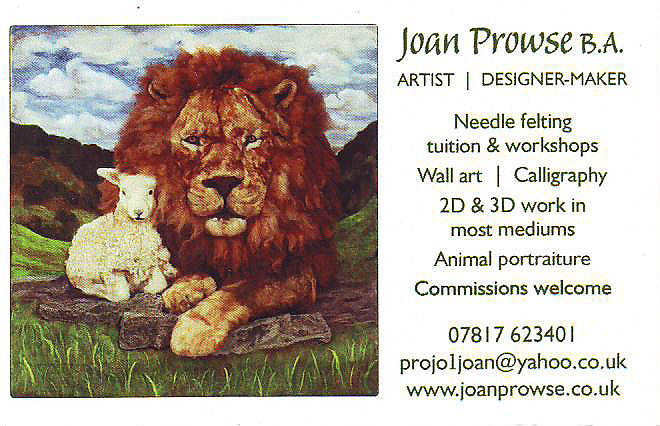 I will be providing a basic stock of paper, card, decorative cover papers, glues, scrap paper, needles and thread. Inktense blocks if you have them. There will be some to borrow but if you have soft pastels, or Koh-i-Noor they will be fine. Sewing machine in full working order with the ability to drop the feed dogs, Instruction book and foot pedal. We do have machines to borrow if you can’t bring yours. The machining is a small part of the day school. Masking tape ¾ inch wide. If you wish to emboss a piece of metal foil as your central square you will need to bring a thick magazine and embossing tools/dried out ball point pen. In this workshop we will be looking at ways to create textured and background surfaces using scrim and Thermofax screens combined with Gesso, Xpandaprint, AcrylicPaints and various other mediums. Although most of these surfaces may work well on their own, they will all be enhanced with further embellishment in the way of stitch, beading or additional mixed-media products and techniques.Each student will take home a variety of samples created during the day. Create a box for precious things using free machine embroidery. The lid will be embroidered using recycled fabric flowers. · Sewingkit – scissors (fabric and paper), pins, tailors chalk, thimble etc. · Inktensepastels/watercolour crayons and paintbrush if you have them – not essential but may be useful to have with you. 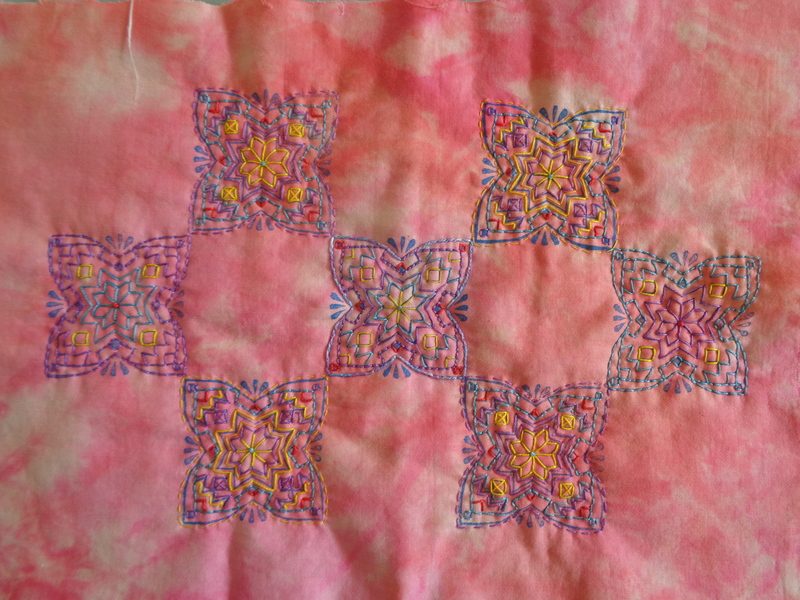 For anyone who loves patchwork and appliqué, Katy Choroszewska’s day class on Mola was a real inspiration. The Kuna women have been liberated by Mola craft as they make a useful income from this folk art, helping them gain welcome independence by selling their much sought-after textiles to the local and tourist markets. If illustrations of Kuna Mola weren’t enough to encourage the group’s interest, then Katy’s own interpretations of the form certainly were! 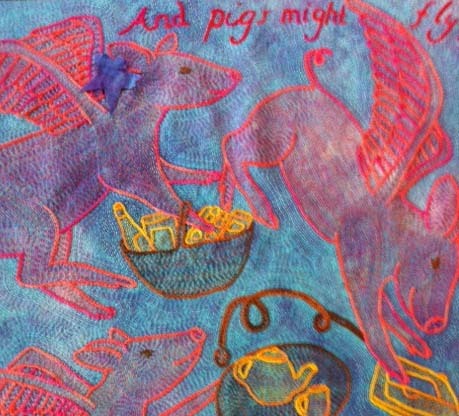 Using her hand-dyed cottons and threads, her work is exquisitely fine, joyous and fun. You will find lots of information on Katy online. Her online shop is well worth checking out for her dyed fabrics and threads. www.tamarembroideries.co.uk and on Facebook www.facebook.com/katy.choroszewska as well as ETSY and Pinterest. Mola is not for the faint-hearted! Patience and nimble stitching makes for the best results. But the effort is repaid by the colourful, creative projects that you can produce. Mola opens up new creative avenues for those among you who love patchwork and appliqué, from pictures, hangings, panels for clothing and quilts. 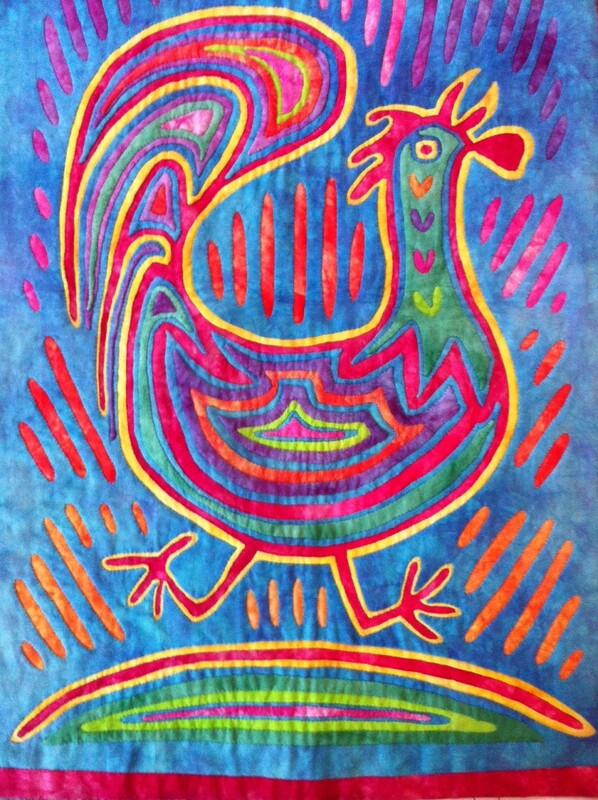 The traditional designs are wonderful but as folk art, new themes and ideas are constantly being introduced (even cartoon characters have been used by the Kuna women!) – leaving each of us free to bring in traditional European folk motifs – or even our own inventions. For those of you who were unable to attend the workshop, Katy shares the basic techniques with us here, mola and check out her website for details of forthcoming classes and exhibitions. Our thanks go to Katy for leading such a brilliant day and for sharing her basic techniques with us here and on the day. Joan ran an introductory workshop for Guild members. 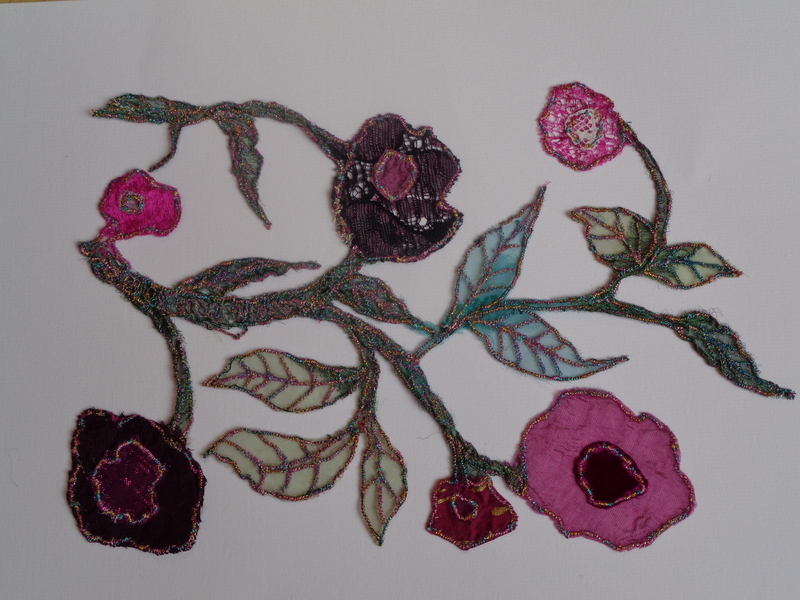 It was a wonderful day and everyone produced felted roses and a landscape.